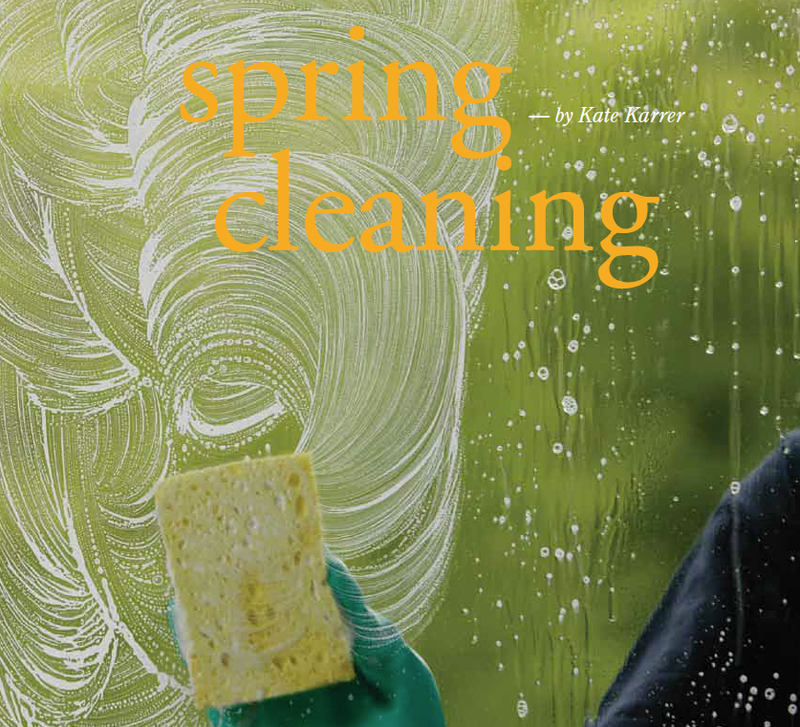 Whether you do it at the beginning of spring or, like most of us, somewhat later, the annual ritual of spring cleaning is all about the heavy lifting that gets rid of dirt and debris, especially in places unseen. Tackling them signals a breath of fresh air in any season. Before the soap/water/vacuum detail of cleaning, confront your stuff and discard or reorganize. De-clutter first, advises Molly Boren, a Ann Arbor-based professional organizer and founder of Simplicity Works. Seeing uncluttered spaces gives a positive mindset. Boren’s mantra? Everything has its place. Put paper (bank statements, medical documents, insurance contracts, credit card bills, etc.) in a designated file; store similar items (e.g., notepads, paperclips and staples) together, then plan your cleaning attack. 2. Eliminate distractions. Answering the phone and checking e-mail foil progress, Boren cautions. Stay on schedule, but factor in a 10-minute break every hour. 3. Make a plan. Be realistic, urges Linda Cobb, Phoenix based author of The Queen of Clean series of housekeeping books. Also, remember that different rooms have different cleaning needs: Create a seasonal cleaning agenda for each room. 4. Create instant reinforcement. Cobb recommends purging, cleaning and reorganizing the least-used room or space first. Seeing a completed task gives a sense of accomplishment. 5. Mind your back. Pair up with a partner for moving furniture. It’s easier, faster, more fun and safer for your back. Never lift a sofa on your own, Boren adds. Instead, shove a towel or rug under the legs, then slide or roll it. 1. Clean from top to bottom. Remember, dust falls. Clean the tops of picture frames, molding, furniture, light fixtures and walls first. Work in downward strokes. Clean, dust, vacuum and wash floors and carpets last. 2. Get to hard-to-reach places. Remove dust and debris from ceiling fans, chairs, sofas, carpet corners and moldings with your vacuum’s attachments. Use small paint brushes and even cotton swabs to remove dust and grime from tight spots. Swipe hard-to-reach surfaces with a towel wrapped around a long-handled broom. 3. Make curtain calls. Freshen curtains by tossing them into a dryer set on low. During the cycle, wash the insides of windows. 4. Tend to cupboards, closets and drawers. Remove all items, then wipe down shelves and drawers. Replace shelf and drawer liners. Reorganize and return items for storage. 5. Conduct a seasonal rotation. Store winter clothes and equipment and bring out spring/summer clothes, sports gear and garden tools. 6. Create containment systems. Designate containers for donations, recycling and trash. Put bins in convenient locations to reinforce tidy habits. 1. Go on gutter detail. Start at one end and flush dirt and debris toward the downspout with a garden hose. Consider installing mesh gutter covers to prevent debris from accumulating. 2. Call in the pros. Line up professional cleaning for rugs, carpets and upholstery. 3. Tend to fans. Adjust ceiling and attic fans. Check the vents on ceiling fans to blow air down. Share your Spring Cleaning tips with us on Pinterest.